Mary Ann Harlan, PhD, is an assistant professor at San Jose State School of Information. She has worked in California public schools for 20 years, of which she spent 11 in middle and high school libraries. Harlan, Mary Ann. 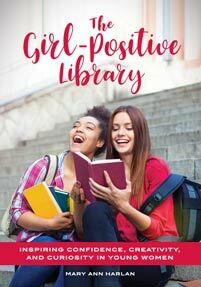 The Girl-Positive Library: Inspiring Confidence, Creativity, and Curiosity in Young Women. Libraries Unlimited, 2018. ABC-CLIO, publisher.abc-clio.com/9781440860645. Providing a model of critique useful in readers advisory, collection development, and book clubs, this title encourages the inclusion of young adult titles advancing a positive representation of girls in programming and instruction.